On May 3rd, Kel will direct a reading of Deborah Brevoort's MY LORD, WHAT A NIGHT as part of Title Wave @ Bay Street: The 6th Annual New Works Festival. In March, Kel directed a new play for the Working Theater in NYC: A LABOR STORY, by Nandita Shenoy and featuring Janice Amaya, Kaaron Briscoe, Bob D'Haene and Naomi Lorrain. Andre Braugher is interviewed by Jeryl Brunner of Forbes Magazine. “Tell Them I’m Still Young is a profoundly hopeful play and a marvelously insightful exploration of a 30-year marriage from an exciting young writer, Julia Doolittle, and a very sharp young director, Kel Haney,” says Braugher. Andres Braugher’s interview with Donny Levit at The Village Green. They discuss Tell Them I’m Still Young and how he became involved with the play. Kel began 2019 directing Julia Doolittle’s Tell Them I’m Still Young at the American Theater Group, featuring Andre Braugher and Michele Pawk. In November 2018, Kel was down in Orlando directing Deborah Brevoort’s My Lord, What A Night for Orlando Shakes’ Playfest 2018. On May 16, Kel directed a reading of Julia Doolittle's Tell Them I'm Still Young (featuring Janice Amaya, Andre Braugher, Evan Maltby & Michelle Pawk) for EST/Youngblood. On April 11, Kel directed Krista Knight's High Blonde as past of the first ever Fresh Ground Pepper Festival at New Ohio Theatre. Kel directed a new play by nine-year old Kassandra (featuring Amber Gray & Ronald Peete) for the 52nd Street Project's Dream Big, The Possibility Plays, from March 23 to 25. On March 3, Kel directed a reading of Eljon Wardally's By A Thread for Fault Line Theatre. On March 1, Kel and Gardiner traveled to San Francisco's Presidio Officer's Club for a one night performance of The Elephant In Every Room I Enter. On February 26, Stable Cable Lab Co. presented a reading of Montgomery by Stephen Brown, directed by Kel Haney. Donny Levit from What's Next New Jersey interviews Sharyn Rothstein about her new play A Good Farmer, directed by Kel Haney. What is the life of an immigrant worth? Are undocumented immigrants entitled to the American Dream? A Good Farmer, by Sharyn Rothstein, explores these questions and more in American Theater Group's inaugural mainstage production at SOPAC. Running January 24th - February 4th, 2018. Directed by Kel Haney. Manhattan Digest's Ryan Leeds interviews Kel Haney on tackling The Elephant In Every Room I Enter. Daily Beast's Tim Teeman interviews Gardiner Comfort on life with Tourette Syndrome and The Elephant in Every Room I Enter. Hollywood Soapbox's John Soltes interviews Gardiner Comfort about The Elephant in Every Room I Enter. Along with 7 other women directors, Kel Haney participated in a round table interview with The Interval. They discussed their outlooks, mentorship, having authority, and more. The Elephant in Every Room I Enter performs in the Richman and Yudell Seminar Series on Humanism and Ethics in Medicine at Mount Sinai, followed by a conversation with Gardiner Comfort & Dr. Barbara Coffey. The Columbia Lion's William Essilfie interviews Gardiner Comfort on The Elephant in Every Room I Enter. 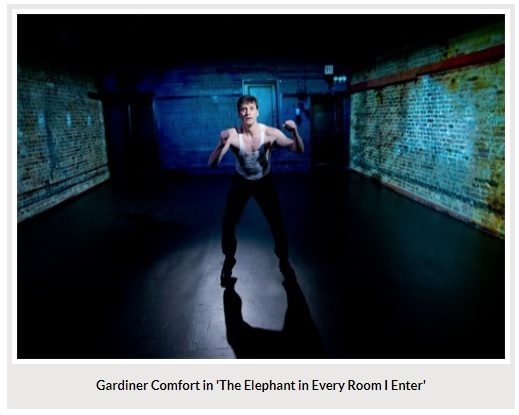 New York Theatre Workshop Announces that The Elephant in Every Room I Enter will appear in Next Door at NYTW's inaugural season. Created by Gardiner Comfort & directed by Kel Haney , running November 9th-26th, 2017. A co-production with New Jersey’s Luna Stage and Passage Theatre Company, Paradise centers on two outsiders – a gifted Muslim-American teenager and her disgraced biology teacher – who form an unlikely partnership to research first love. Science, religion, and exploitation are all fair game as both lives change forever. Running October 5th - 20th, 2017. Written by Laura Maria Censabella and directed by Kel Haney.